During the last decade, the high-throughput genomic technologies have revolutionized the conduct of biomedical research. The ability to simultaneously monitor genomic-scaled data allows scientists to obtain a much deeper understanding of genomic complexity and molecular regulation. The advent of these technologies also provides an unprecedented opportunity to accelerate biomarker research and therapeutic development. However, the explosion of genomic data imposes a great challenge to the research community. The realization of medical advancement through genomic discoveries will depend largely on the ability to dissect the massive amount of genomic data. This includes the correlation of genomic patterns with phenotypic data, how to construct the pathways by which environmental components interact with personal genomes to influence disease susceptibility, and how to integrate existing biomedical knowledge to accelerate discovery and generate new hypotheses. Dr. Spencer Huang’s research has been in line with this direction. 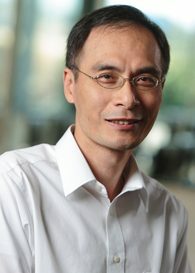 Specifically, he has been focused on 1) how to employ modern genomic technologies, bioinformatic, and biostatistical techniques to accurately predict risk and treatment response in cancer and cardiovascular disease; and 2) to promote genomics and functional genomics research by providing state-of-the-art analytical expertise and consultation support to the research community in order to advance understanding of the major molecular mechanisms and pathways that modulate disease progression. Dr. Huang is particularly interested in “big data” science and the mapping of genome to phenome through network modeling.